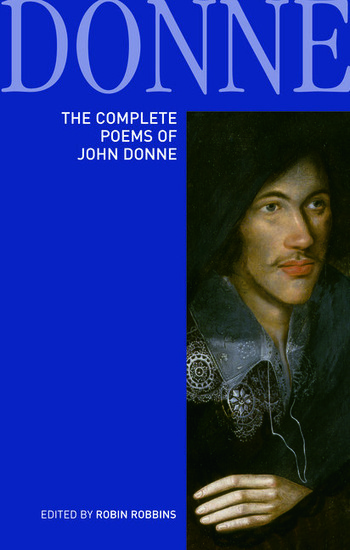 The Poems of John Donne is one volume paperback edition of the poems of John Donne (1572-1631) based on a comprehensive re-evaluation of his work from composition to circulation and reception. Donne’s output is tremendously varied in style and form and demonstrates his ability to exercise his rhetorical capabilities according to context and occasion. This edition aims to present the text of all his known poems, from the epigrams, songs and satires written for fellow young men about town, to the more mature verse-epistles and memorial elegies written for his patrons. The Longman Annotated English Poets series traditionally aims to present poems in chronological order; in this edition, however, the principle has been observed only within generic sections. This organisation reproduces the manner in which Donne’s original readers first encountered the poems in the various manuscripts of his elegies and satires that circulated in Donne’s lifetime. Volume One contains the Epigrams, Verse Letters to Friends, Love Lyrics, Love Elegies and Satires; Volume Two contains the religious poems, Wedding Celebrations, Verse Epistles to Patronesses, Commemorations, and the Anniversaries. The lyrics have been arranged alphabetically for ease of reference and because, in all but a few cases, precise date of composition is impossible to determine. Each poem has extensive editorial commentary designed to put the twenty-first century reader in possession of all that is necessary fully to appreciate Donne’s work. A substantial headnote sets each poem in its historical and literary context, while the annotations give detailed guidance on the wealth of classical and religious allusions and give full representation to the literary, historical and philosophical culture out of which the poems grew. In keeping with the traditions of the series, Donne’s own text has been modernised in punctuation and spelling except where to do so would alter or disrupt a rhyme.